During Jane Seymour's marriage to Henry, a courtier named Sir Nicholas Carew took a traditional approach to religion by fiercely opposing radical reformers such as Thomas Cromwell. Born in or before 1496, he was the first son of Sir Richard Carew of Beddington and Matilda, daughter of Sir Robert Oxenbridge of Ford in Sussex. He had been knighted by July 1520. He could trace his family back to the time of the Norman Conquest, although the Carew name had only formed during the reign of King John. Carew was expelled from court for a time in 1519 but returned quickly. By the 1530s he was supporting Princess Mary and was even considered to be useful by Emperor Charles V, the staunch defender of Catholicism. In the end Carew was executed at Tower Hill in 1538 or 1539, although the reason for his fall is not clear. Hailing from Yorkshire, Aske took the position of attorney at London's Gray's Inn. He also commanded the northern Catholic uprising, which was known as the Pilgrimage of Grace, in opposition to Henry VIII's attack on the monasteries. He was hanged in chains for treason on 12 July 1537, outside Clifford's Tower, the keep of York Castle. Rather than suffer a traditional hanging with a sudden drop to break the neck or reduce the hanging to a few moments, the victim would be lifted off their feet by the neck and the weight of the chains would slowly suffocate them over several days. 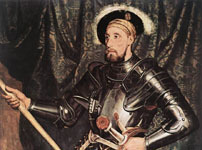 Father of Henry's fourth wife, Anne, the duke of Cleves was allied to the Lutherans, although he was not a Lutheran himself. In 1539 Henry VIII showed signs of interest in an alliance as a defence against a possible crusade against England, but when the Franco-Spanish friendship began to weaken, the need for such a move lessened. Duke John himself died at the beginning of the same year, and had been succeeded by his son, William. Cleves and the location of its former duchy are on the lower Rhine. 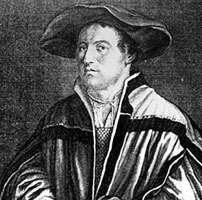 Duke John was a leading figure of Protestantism in Germany. The son of accomplished painter Hans Holbein the Elder, he was born in Augsburg in 1497. He learned his skills under his father and was appointed painter to Henry VIII in 1536. As well as his infamous painting of Anne of Cleves, he also produced designs for woodcuts for Martin Luther's Old Testament and New Testament, and numerous portraits of leading English figures, including Thomas Cromwell and several of Henry's other wives.